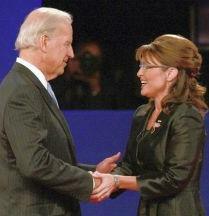 The vice presidential candidates, Democratic Sen. Joe Biden and Republican Alaska Gov. Sarah Palin, debated at Washington University in St. Louis, Missouri, on Thursday, Oct. 2nd, 2008. Gwen Ifill of PBS served as the debate moderator. The Commission on Presidential Debates (a bipartisan private group) is the sponsor of this event. The debate became controversial even before it began, when it was discovered that the moderator was planning to release a book about Obama -- "The Breakthrough: Politics and Race in the Age of Obama", by Gwen Ifill, scheduled for release on Jan 20, 2009. The book, as planned, contains one chapter about Obama, which Ms. Ifill claimed she had not yet written. Since Ms. Ifill's book would be more profitable if Obama wins, one could attribute bias as a moderator. The debate sponsors resisted pressure to replace Ms. Ifill, and there have been no post-debate complaints about bias. The debate itself was billed as a test of the two candidates' ability to NOT flub up in front of millions of viewers. Expectations were low for Sen. Biden, who has a history of embarrassing public statements, including some about Obama. Expectations were even lower for Gov. Palin, after an interview appearance with Katie Couric which was viewed as unworthy of a vice-president. Both candidates, however, easily surpassed their low expectations, and hence the debate was most notable as a non-event. The debate content itself, as evidenced by our copious excerpts, did cover a lot of ground. This was the only appearance in which Gov. Palin will directly face her opponent, and hence we consider it the best source of insight into her issue stances and her abilities. Although Sen. Biden has appeared in numerous other debates in this year's priamries, this debate is, for him as well, the only venue where he faces a Republican opponent directly. Astute viewers could discern a couple of flubs, however. Sen. Biden referred to residents of Bosnia as "Bosniacs" instead of "Bosnians" -- a surprising slip-up since he was deeply involved with Pres. Clinton's military engagement in Bosnia. If Gov. Palin (or Pres. Bush!) had made that mistake, the mainstream media would repeat the flub endlessly and mercilessly until Election Day. Gov. Palin's biggest flub was in okay'ing Vice President Cheney's expansive view of executive power. The moderator's question presumably referred to Cheney's insistence that the Vice Presidency is subject to Constitutional rules about Congress, since the Vice President votes in the Senate when there is a tie vote. (The purpose in Cheney's insistence was to claim that he was NOT subject to document requests under rules about the Executive Branch, in effect attempting to define a fourth branch of government). Constitutional scholars have universally ridiculed that stance as contrary to the intent of the framers, and as just another in a long series of usurpations of power by the Bush-Cheney Executive branch. Yet Gov. Palin agreed with Cheney's stance, claiming that the Vice President's role is "flexible." We consider Palin's answer to certainly be an error in Constitutional interpretation -- Article I of the US Constitution states unambiguously that "All legislative Powers herein granted shall be vested in a Congress," i.e., none in the Vice President. Article II just as unambiguously states that "The executive Power shall be vested in a President... together with the Vice President." We consider this a legal flub on Palin's part -- anyone who took the time to read the Constitution would agree that the Vice President is solely embedded in the Executive Branch. Of course, the voting public does not care about legal scholarship issues like that. The public DOES care about this flub as a POLITICAL issue, however. By associating herself with Cheney's incorrect view of the Constitution, Gov. Palin associates herself with an unpopular presidency. Worse, Palin directly associates herself with one of Bush-Cheney's most unpopular aspects, the aggrandizement of power in the Executive Branch. That is a serious political error. Palin's flub creates an opening for the Obama-Biden campaign to paint a picture of Palin continuing the Bush-Cheney policy of ignoring requests for open records; maintaining an unnecessarily high level of secrecy; and of stonewalling against Congress. Gov. Palin deserves criticism on this point, as does Vice President Cheney. Cheney's stance, which is now Palin's stance, hurts democracy and hurts America, regardless of party. This debate drew about 70 million viewers -- a record for a vice-presidential debate. That's unsurprising because of the singular importance to the race, and because of the public's high level of interest in Gov. Palin. That viewership handily surpassed the figure for the prior week's presidential debate, which drew 52 million viewers. The first Obama-McCain debate took place on a Friday evening, however, so more viewers are expected for their second debate. Joe Biden: Obama�s economic plan focuses on middle class. Joe Biden: Deregulation got us into the housing crisis. Sarah Palin: We suspended campaign to work on economic reform. Sarah Palin: Predatory lenders got us into the housing crisis. Joe Biden: No on gay marriage; yes on equal treatment. Sarah Palin: Non-support of anything but traditional marriage. Sarah Palin: FactCheck: No, Obama�s plan won�t tax millions of businesses. Joe Biden: No Child Left Behind was left behind. Sarah Palin: We need more flexibility in No Child Left Behind. Joe Biden: I have supported clean coal for 25 years. Joe Biden: Cause of global warming is clearly Man-made. Joe Biden: Obama believes in investing in alternative energy. Sarah Palin: All-of-the-above approach to deal with climate change. Sarah Palin: Drill, baby, drill. Sarah Palin: I do support capping carbon emissions. Sarah Palin: Exxon & Conoco are not my biggest fan. Sarah Palin: Nonsensical to leave domestic supply untapped. Sarah Palin: Cyclical temperature changes affect climate change. Joe Biden: I�ve been a single parent; I know the difficulties. Joe Biden: Time to sit down and talk, talk, talk to enemies. Joe Biden: Bush�s approach to middle east has been disastrous. Joe Biden: FactCheck: McCain did not refuse to sit down with Spain. Sarah Palin: Two-state solution for Israel/Palestine is a top priority. Sarah Palin: Some dictators hate America & what we stand for. Joe Biden: Led fight against Bork based on ideology. Sarah Palin: Agrees with Cheney that VP as executive is flexible. Joe Biden: McCain health plan is ultimate Bridge to Nowhere. Sarah Palin: $5,000 tax credit for families to buy their own coverage. Sarah Palin: FactCheck: Obama�s plan does not remove private insurance. Sarah Palin: FactCheck: McCain�s plan costs $14B/year; not budget-neutral. Joe Biden: We spend same in 3 weeks in Iraq as 7 years in Afghanistan. Joe Biden: Obama worked with Republicans to reduce nuclear weapons. Joe Biden: Greatest security threat is from al Qaeda in Pakistan. Sarah Palin: Terrorists in Iraq are the biggest threat to Americans today. Sarah Palin: Economic sanctions on North Korea for nukes. Joe Biden: As VP, I�ll be point person in Congress. Joe Biden: Cheney has been most dangerous VP in history. Joe Biden: 35-year track record of accomplishments. Joe Biden: McCain no maverick on education, health care, and debt. Sarah Palin: Shares McCain world view of US as shining city on the hill. Sarah Palin: By working with all parties, never had to compromise. Joe Biden: Middle class is U.S. economic engine and needs tax cuts. Joe Biden: FactCheck: McCain did not vote with Obama on tax increase. Sarah Palin: Under Obama plan, small businesses will see tax increases. Sarah Palin: FactCheck: Undoing Bush tax cut only hits families over $83K. Joe Biden: We will end Iraq War; McCain has no end in sight. Joe Biden: My push for Bosnian intervention saved 1000s of lives. Sarah Palin: No white flag of surrender on Iraq. Sarah Palin: Divest from Sudan; enforce no-fly zone in Darfur. Sarah Palin: FactCheck: No, we�re not back to pre-surge troop levels. Sarah Palin: FactCheck: No, Afghan general did not say a surge would work. The above quotations are from 2008 Vice Presidential debate, Gov. Sarah Palin (R, AK) vs. Sen. Joe Biden (D, DE), at Washington University in St. Louis Missouri.